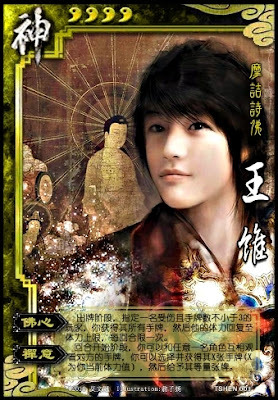 Once per turn, Wang Zhi can choose a player that is damaged and has at least three hand cards. He takes all that player's hand and they are restored to full health. At the beginning of his turn, Wang Wei can choose another player. These players look at each other's hand. Wang Wei can take X cards from them. Then Wang Wei must give them X cards. X is the amount of heath of Wang Wei. There is no limit to the amount of heath that can be recovered through "Buddha's Heart". The target must be willing to lose at least three cards however. Wang Wei can look at a players hand without changing cards. The other player gets to see Wang Wei's hand as well. When he changes cards, Wang Wei must exchange the exact number of his health. He cannot do a smaller amount.